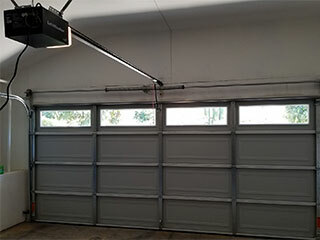 A garage door is a complex mechanical system, and in order for it to operate to its full potential, it needs proper maintenance, care and attention. Luckily, our local technicians provide professional service designed to help you ensure your system stays in shape. Wear and tear is inevitable, and never more so than during the lifetime of your garage door system. Your system relies on a number of different components, and over time, different parts will incur dinks and dents. Lubrication of the moving metal parts will help to reduce a great deal of deterioration and help to increase the shelf-life of most of the hardware, including the hinges, rollers and torsion springs. Our experts will lubricate the components and check their condition and ability to function safely. A balance test is an important part of any garage door maintenance visit. It will allow our technicians to discover whether or not spring tension has decreased over time, one of the first signs that a spring may give way in the near future. This type of job can be dangerous, so don’t attempt to do it alone. It’s definitely a job best left to the experts! During a schedule garage door maintenance visit, our team will carry out a number of different checks. This will include testing your electric opener’s safety features. In order for your photo eyes to function effectively and detect an obstacle in your door’s path, they must be perfectly aligned. It is also important to make sure that the auto-reverse mechanism is operating properly too. Without it, the door won’t reverse when it detects or comes into contact with an unknown object. Our local team at Garage Door Repair Northport will make sure that your system is in tip-top shape. We will deal with any minor adjustments or damage on the spot. Contact us today to learn more about our specialist services.